We have allowed boxers to own our family for greater than 30 years. Our home is not complete without at least one being with us at all times. They consume our lives, and we would have it no other way! This very special boy left a mark that is forever lasting as well as a huge hole left allowing unconscionable pain and grief to exist. Oakley was an ABR dog who we fell in love with and adopted him on the spot! He loved to take road trips, and we made many – his last one was to play in the snow in Red River. He saw ya through two doctoral degrees. He is the smartest guy, ever 🎓. He wanted for nothing. All routines were adjusted to meet his needs, and we would have never had it any other way. He loved us and when he was diagnosed with rapid onset osteosarcoma which had no good options other than to love him until the pain was too hard to control. We reminded him he was our best friend and family member… That unthinkable day came where we had to say our goodbyes. Oakley promised us that he would send us a “ message “ that he was in a better place and no longer suffering, he also promised we would get through this. We all agree in our home that these beautiful boxers educate us and aggregately over the years we become well-trained boxer families. That amount of love is essential to take care of another boxer who needs a loving family. 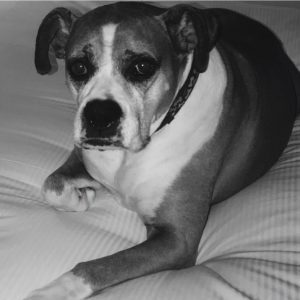 Thanks to Oakley, we had the strength to move forward and attend another ABR event where this beautiful female boxer approached us – she was identical to Oakley – this was our sign from him … this was just how unbelievably sensitive and unselfish he was. We love our new girl – GRACIE – we think Oakley had a hand in this decision. We will never ever forget him, and he leaves marks on our hearts and in our lives that are indelible.